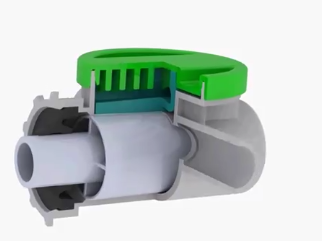 The single-use pump technology comprises of five components – the housing, rotor, spring barrel, seal and seal cap. The rotor contains a number of cavities that transport liquid around the pump from the inlet to the outlet. The spring barrel seals the housing membrane onto the rotor. The rotor is turned by a motor and as it rotates a vacuum is created at the inlet. Liquid is sucked into the cavities and transported around the pump where the liquid is wiped into the outlet by the spring loaded membrane. A precise volume of liquid (the volume of the cavities) is dispensed during each revolution. The flowrate can be increased or decreased by adjusting the speed of the motor. The dose volume is proportional to the number of revolutions programmed into the motor.